December 19, 2018 – Rod McDermott flew a team in his CJ2 to assist in the Spirit of Liberty Foundation’s 17th Annual Operation Christmas Miracle (OCM). The nonprofit foundation is dedicated to honoring and supporting America’s heroes, armed forces, and first responders. 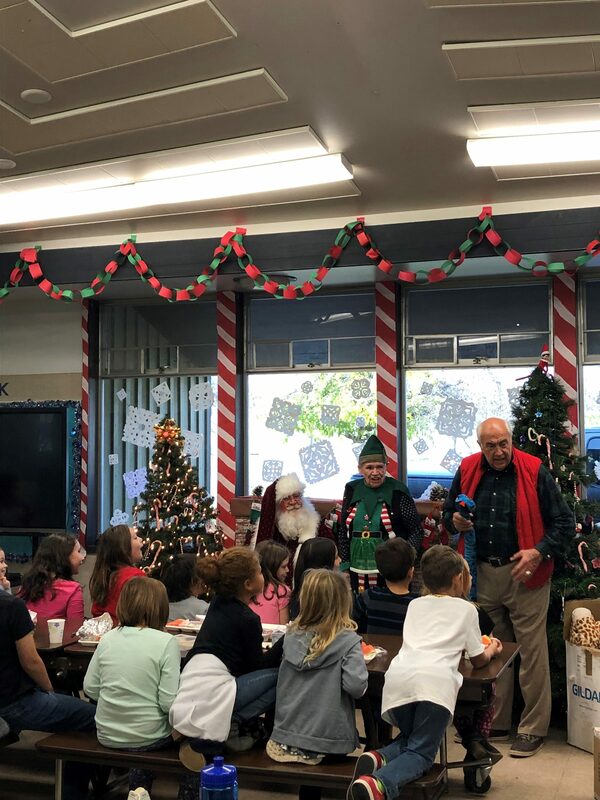 This year, the OCM project brought Santa, gifts, and Christmas cheer to those affected by the Camp Fire in Paradise, CA. Rod was informed about the volunteer opportunity through his involvement with Angel Flight West, an organization that provides flights to those in need. 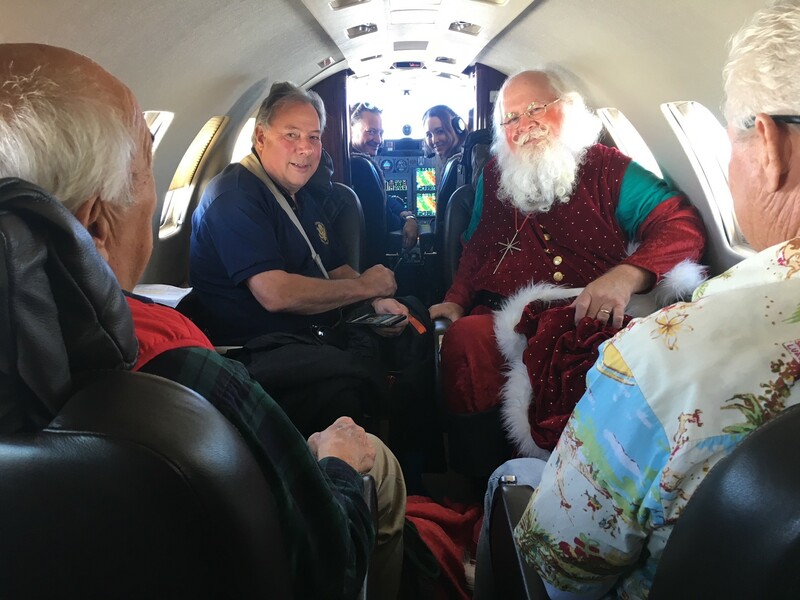 Flying from Santa Ana, Rod and his co-worker, Samantha Lee, landed in Carlsbad, CA to pick up an ABC news correspondent, Cassie Carlisle, and four Spirit of Liberty personnel – Richard Rovsek, Gary Boblieff, Michel Rainey, and William Davis – dressed as Santa. Rod McDermott captains his CJ2 alongside Samantha Lee and four Spirit of Liberty workers, as Cassie Carlisle snaps a picture of the bunch in transit to Paradise, CA. 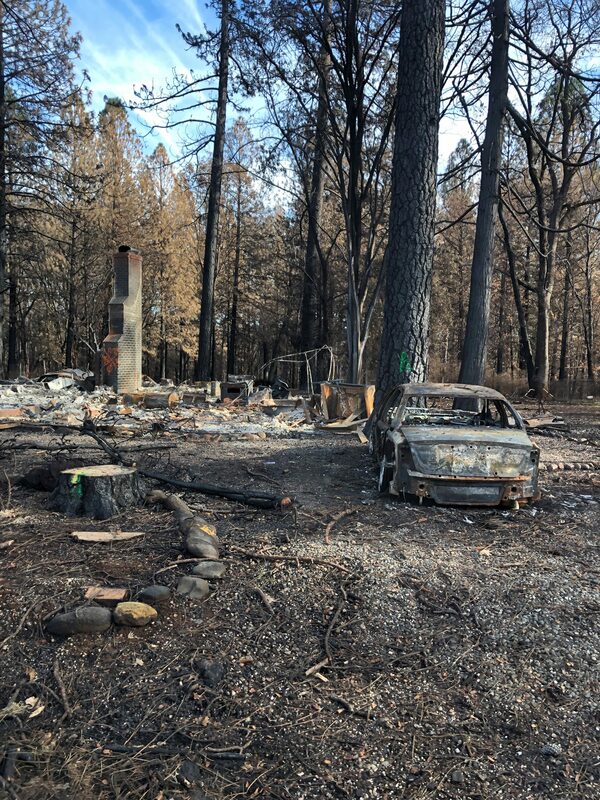 From Carlsbad, the group made its way to the scorched town of Paradise, where the Camp Fire took 88 lives and destroyed thousands of homes. A burned down car rests next to the remnants of a home. The chimney remains standing alone in the rubble and ash. Rod and the others made their way to Spring Valley, a recently reopened elementary school. Santa distributed donated gifts from the NFL, the San Diego Zoo, and the NBA to children who had lost everything in the fire. The kids laughed and smiled with Santa as they took the gifts eagerly from his hands, excited to have something that belonged to them again. Kids gather around Santa as they receive their gifts. “Each day we’re trying to bring smiles to their faces and today Santa did just that,” Josh Peete, Spring Valley Principal, said. Later in the day, the firemen transported the group to visit members of the California Conservation Corps that were clearing hazardous underbrush and decaying materials to prevent future fires. 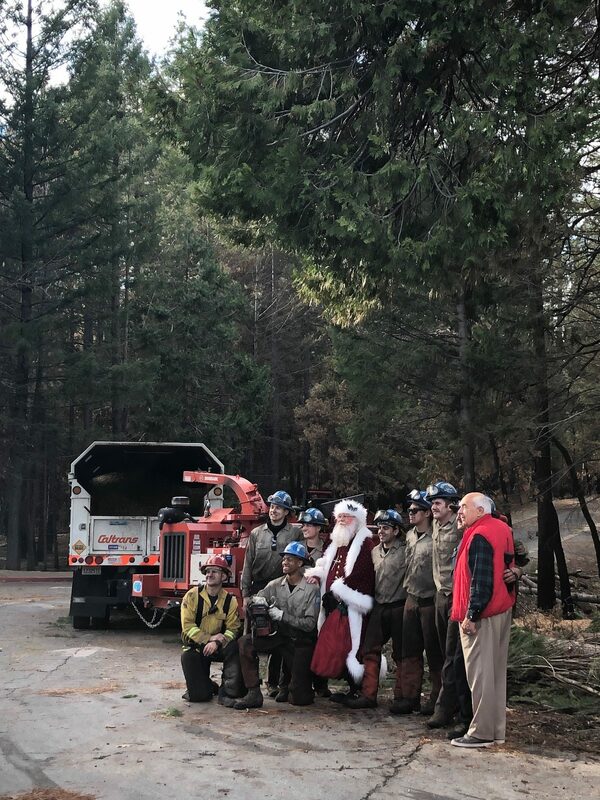 Santa stands alongside California Conservation Corps workers as they take a break from restoring the devastated terrain. The firemen led them to Fire Station No.1 where Battalion Chief Curtis Lawrie expressed his gratitude for his staff as well as volunteers who helped the community in this emergency. 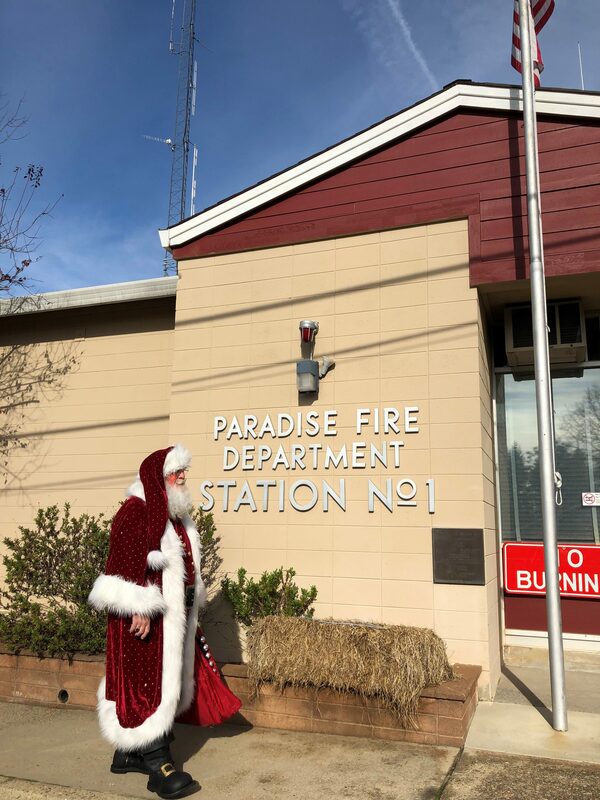 Santa enters the fire station to meet and talk with some of the first responders. Lawrie recalled that for a period of four hours, he wasn’t sure if his family was safe, but he knew that he needed to continue fighting the fire, to give them and others the best chance of survival. “I’m really thankful that so many people helped each other… I’d like to say the best part of humanity showed up that day,” Lawrie said. Later, the team was brought to the Butte county Sheriff’s Department where the Sheriff and other law enforcement personnel were distributing donated resources to the first responders and their families. 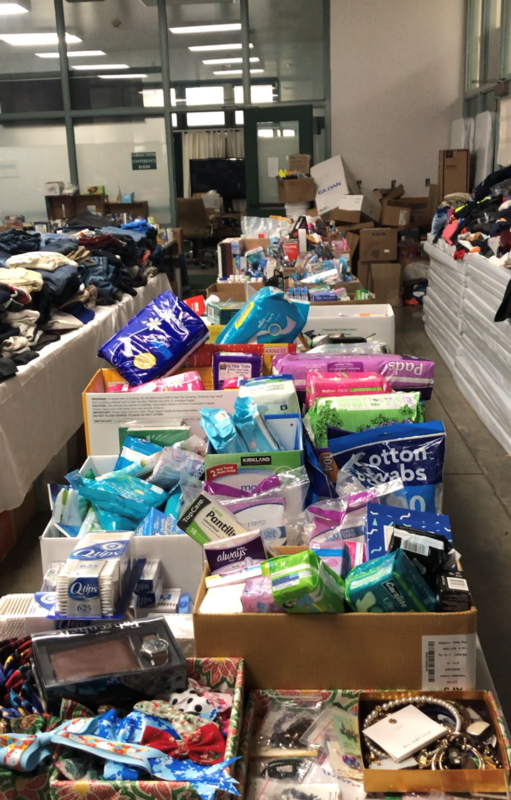 Tubs of food, clothes, child supplies, and other resources covered the Butte County Sherriff’s Department, as all donations had been made readily available for first responders and their families. Finally, the group made their last stop to visit the 911 dispatchers and FEMA workers to offer gratitude for their services and bravery in the wake of the fire. After a day filled with giving out gifts, resources, and supplies, the team boarded the plane, hoping they made the fire victims’ Christmas brighter and cheerier in the midst of this tragedy.